Temperatures have dropped to pretty unbearable levels in most parts of the country, which means many of us begrudgingly have to temporarily shelve cute outfits in favor of boring fleece and clunky winter boots. But guess what? Just because it’s winter, doesn’t mean we have to collectively resign ourselves to giving up on style, it just means we all have to think a bit more creatively when getting dressed in the morning. 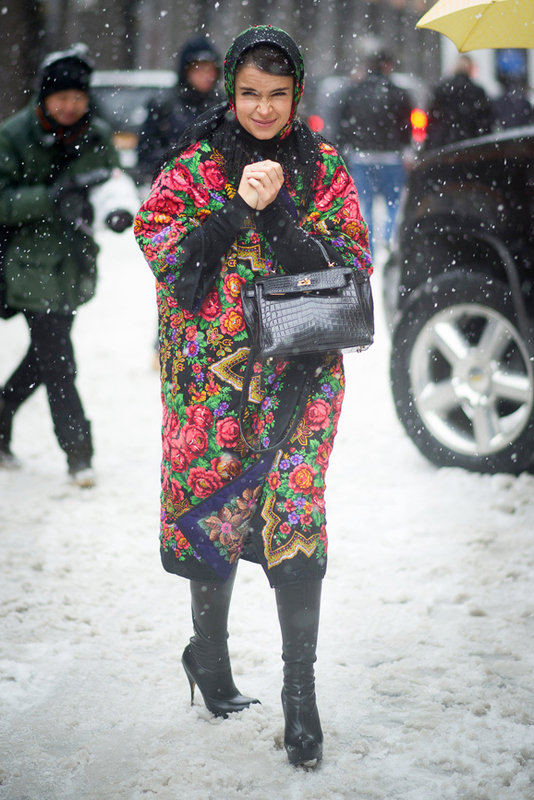 We promise: Great style—even in the depths of winter—is very possible. Here, a few of our top tips and tricks. And seriously, stay warm out there. 1. Become a layering pro. There is a reason layering is such a big trend this season: it’s a massively practical way to dress when it’s really cold. So don’t be afraid to pile on the layers. A turtleneck, under a sweater, under a jacket, under a coat, for instance, will definitely keep you warm. So will a dress or skirt over a pair of pants (much warmer than a pair of tights). When it’s really, really cold outside, sometimes even the items in your wardrobe that you always depend on (everything from ripped jeans to cashmere sweaters) no longer cut it. This is when you have to find creative ways to layer under your clothes that no one will notice. You can, for instance, throw a pair of tights or sheer stockings under a pair of ripped jeans or layer a form-fitting sweater over a long-sleeve T-shirt (we’re fans of Uniqlo’s Heattech long sleeved t-shirts for this very reason). Also don’t be afraid to whip out the long johns you normally reserve for ski trips—sometimes during the winter they’ll come in just as handy for the walk to work. 2. Let your boots steal the show. 3. Belt your coats to give them new life. 4. Embrace fur (or faux fur, of course). There aren’t many redeeming factors about living through really cold weather fashion wise, the one being it’s the only time during the year that you can wear fur (or faux fur, of course). So just have fun with it! You can wear fur with just about anything to give your outfit an instant upgrade: invest in a statement fur topper, throw on a fur vest or stole over your winter coat to give it some new life, or find cool fur accent pieces like fur collars or even fur mittens to liven up your winter outfits. 5. Invest in a show-stopping hat. Your first instinct in the winter is to splurge on a pair of boots or a coat, but we’re here to advise you to hunt high and low for the winter hat of your dreams. You’re going to be in that thing for a solid two months from here on out (not to mention it’ll be the first thing people will notice about you), so it should be something you love. Scarves can be worn in many more ways than simply wrapped around your neck, and winter is the perfect time to experiment. We love the retro look of a scarf tied around your head, belted on top of a jacket, or even tied in a knot around your shoulders.